Shopkins #17 - MyMagazines - Subscribe online and save. 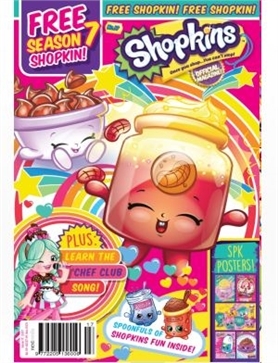 Grab the new issue of Shopkins magazine for mega spoonfuls of Shopkins fun! Join Peppa-Mint and learn the Chef Club song, follow Freezy Bites’ recipe to make yummy ice cream sandwiches, challenge yourself with all the different Shopkins puzzles and more. There also super cute posters inside, plus this issue comes with a free Season 7 Shopkin!